Off Route 15 on the northwestern entrance to Eggemoggin Reach. Pumpkin Island lighthouse was established in 1855 as a result of vessels carrying lumber and for increasing tourism to the area. 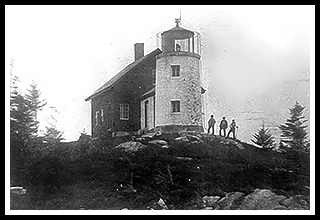 The lighthouse had one of the earliest Fresnel lenses in Maine incorporated into its construction. It stands 28 feet high with a black lantern. During the Civil War at the Battle of Fredricksburg, Charles Babson was shot and had to have his leg amputated. During his recuperation one day, he didn’t move and was pronounced dead as word was sent out to his family about his demise. Hours later a nurse noticed one of his fingers moving, and with the help of a doctor, were able to revive him. He was appointed keeper to Pumpkin Island Light and successfully tended the beacon with one good leg from 1870 to 1902. 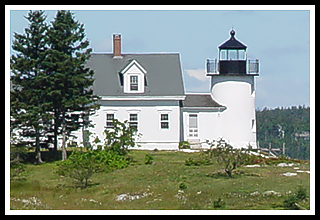 Pumpkin Island lighthouse is located near Little Deer Isle. Little Deer Isle is actually part of the town of Deer Isle where visitors will find little has changed over the last 50 years. There are numerous fishing villages all around this area of islands with lobstering and fishing as the main source of the economy, although tourism has also found its niche in Deer Island and the area. Because of its quaint untouched beauty, many artists and photographers live and also frequent this area. There are a number of historic B&B's around his area to enjoy some real Maine hospitality. There is also Causeway Beach, a little sandy beach open to the public free on a hot day. You can also find plenty of places to canoe or kayak around the many islands that surround this area. Check out Nervous Nellie’s Jams and Jellies. Not only can you get great tasting jams, but a glass pot buoy, pottery, nervous Nellie story episode books, and birdhouses among other gift items. While you’re there, explore the interesting art sculptures made of industrial scrap, wood, and all kinds of materials by owner Peter Beerits. Not just your typical store. From Route 1 in Orland, take Route 175 South to Route 15. From Route 15, cross the Deer Island suspension bridge and turn right after the visitor station onto Eggemoggin Road. Continue on Eggemoggin Road for almost 3 miles to the end. You'll find a turn off spot where visitors are not allowed to go any further (sign stating as private path), where you can still get a close view of the lighthouse. Boat cruises and sailing vessels mentioned below may offer many types of cruises. While some may offer specific lighthouse cruises, some will pass by Pumpkin Island Lighthouse as part of charters, narrated wildlife and historic tours, windjamming adventures, fishing tours and other types of excursions. Weather is also a major factor in New England, especially on sailing excursions. 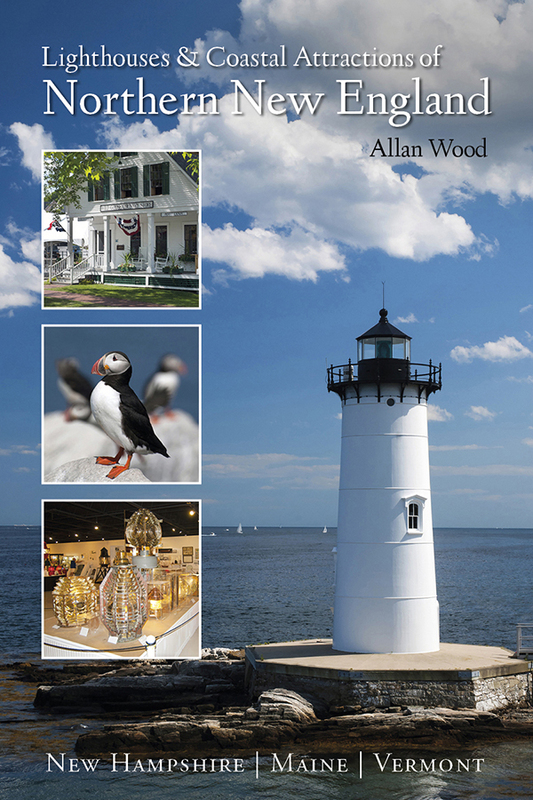 My 300-page book (with over 360 images), Lighthouses and Coastal Attractions of Northern New England: New Hampshire, Maine, and Vermont, provides human interest stories from each of the 76 lighthouses in the northeast, along with plenty of coastal attractions and tours near each beacon, and contact info to plan your special trips.